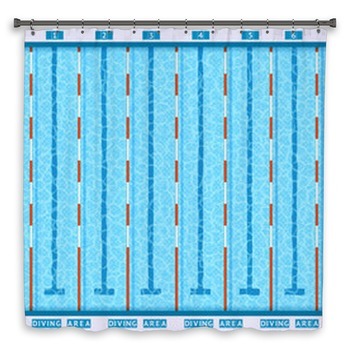 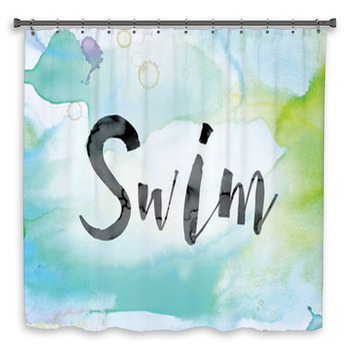 Whether it's competitive swimming, swimming in a pool with the kids or swimming in the ocean that you and your family love most, we have the swimming themed shower curtains, towels and bath mats you need to bring the fun of swimming into your daily life. 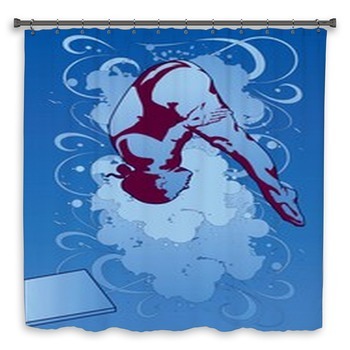 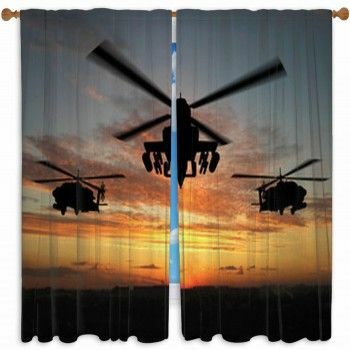 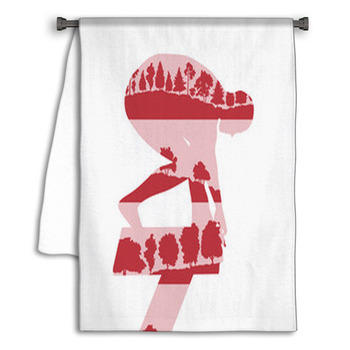 Decorate your bathroom with a set of custom shower curtains that display a photo image that will help your kids enjoy taking a bath as much as they enjoy swimming on a vacation. 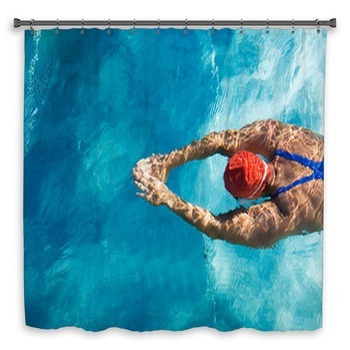 Kids will love swimming shower curtains featuring two young boys and a girl lying on the beach with big smiles on their faces and brightly colored snorkeling gear on their heads. 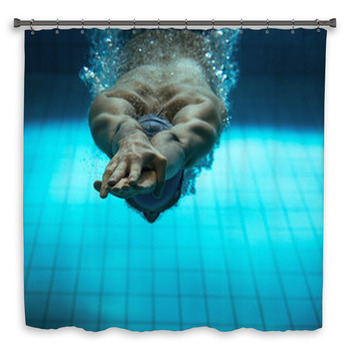 Swimming is a sport that requires incredible fitness, and it is becoming more popular all the time. 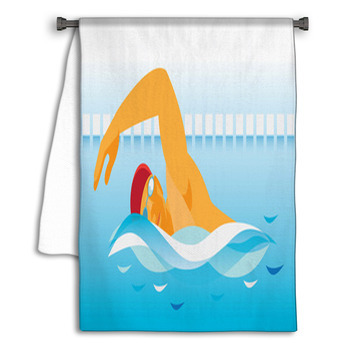 Encourage your teen to work hard to do well on the swim team with a towel that captures the competitiveness and intensity of swimming. 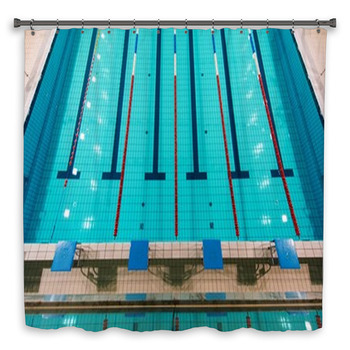 These include towels showing the view of racing lanes in an Olympic sized pool from the perspective of a swimmer about to dive into the water, a woman in silver headwear photographed as she bursts above the water while doing a breaststroke, and a row of male swimmers the instant their hands hit the water in the middle of their starting dive. 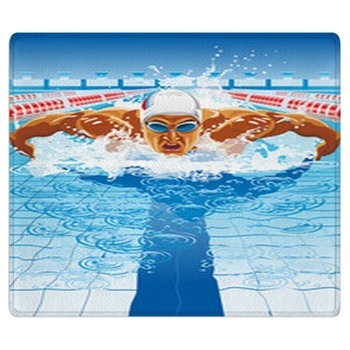 Add some relaxation to the swimming themed decor in your bathroom with a bath mat depicting a peaceful and gorgeous tropical vista. 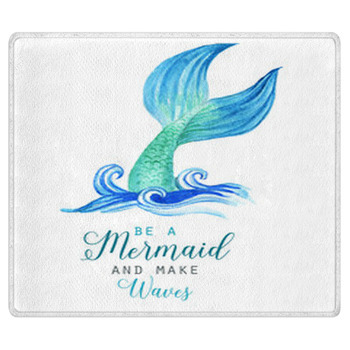 How about three straw roofed wooden bungalows sitting at the base of a lush green mountain island, overlooking a shallow, turquoise ocean that is perfect for a refreshing swim? 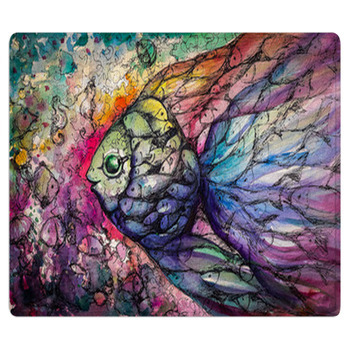 If you are adventurous, choose a bath mat that displays a scuba diver watching a huge sea turtle swim alongside two yellow and white striped fish, above bright red coral.